Our team of BMW Certified Master Technicians and Advisors provide high quality service you can trust. Customers nationwide come to Bob’s BMW to get their motorcycles serviced because we have a reputation of getting it right the first time! In addition to getting service you can trust at Bob’s BMW, when you bring your bike in for service, a complimentary 38-point safety inspection is performed, the VIN is run through the system for open recalls, and all bikes are washed once service is complete. And as an extra convenience to our customers, a fleet of loaner bikes is available at no charge (ask a service advisor for details) to keep you in the saddle while your motorcycle is in for maintenance. 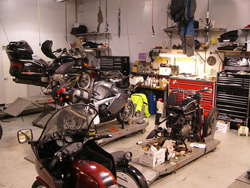 Our services include general motorcycle maintenance and repair, restoration and refurbishing including component repair and restoration, and modifications and customization. We are an Authorized Hannigan Sidecar and Trike Service Center for BMW, Harley Davidson, and Honda, as well as an Authorized Maryland State Inspection Center for all brand motorcycles. Bob’s state-of-the-art facility offers fourteen lifts, two of which are designated to no appointment necessary quick oil and tire changes. Show up (no appointment necessary) at least one hour before closing Tuesday thru Saturday for an oil or tire change, and one of Bob’s Technicians will do their very best to get you in and out as fast as possible. At Bob’s BMW, we schedule service appointments, Tuesday – Friday. On Saturdays no appointment is necessary! Customers are waited on a first come, first serviced basis on Saturdays. You can stop by before or after your Saturday ride for any while-u-wait mileage or annual service, tire change, or select accessory installation. In an effort to accommodate as many customers as possible on Saturday, larger diagnostic work must be scheduled Tuesday- Friday. If you are unsure if your service qualifies as a while-u-wait Saturday service, call 301-497-8949 ext. 502 to confirm with a Service Advisor. HINT: On Saturdays riders typically arrive in two waves: the early birds arrive before we open to reserve their spot in line and get the coffee started (everything you need will be waiting for you when you arrive). This first wave is usually out around noon which is around the time the second wave of riders arrive. The Riders Lounge in our Service Department offers comfortable seating, an area to hang your gear, free wifi access, excellent reading materials, detailed maps to plan your next ride, and snacks and beverages! Get $15 OFF your scheduled appointment if it rains and you keep your appointment! Simply mention Bob’s rainy day special upon arrival. Call 301-497-8949 ext. 502 to schedule your next appointment.